The priest walks up three marble steps and faces the altar, speaking in Latin. The congregation of about 60 responds in Latin. Most of the women are wearing white veils or scarves over their hair. Two altar boys kneel on marble steps, facing the altar, and ring bells during the consecration of the communion wafers. The altar table, beneath an elaborate canopy on four posts, bears six two-foot tall candles on large candalabras, and four shorter candles. The cathedral-style architecture of Blessed Sacrament Catholic Church in West End still looks much like it did in the early 1960s, and the weekly Latin Mass looks much as it would have then. The Second Vatican Council, which met from 1962-65, decreed that the Mass, which had always been celebrated in Latin, would be translated into the vernacular. From 1966 until five years ago, any priest wishing to lead a Latin Mass needed permission from a bishop. 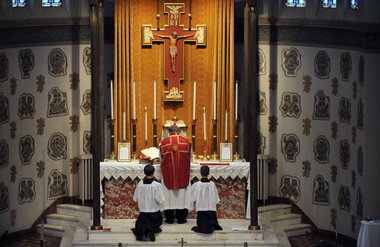 That permission was not always granted, because there was a fear by many church leaders that nostalgia for the old Latin Mass would create a schism and rejection of the liturgy in English and other languages. In 1997, Pope Benedict XVI declared that priests could lead a Latin Mass without a bishop’s permission. That was a decision that opened regular Latin Mass up for a new generation. The Rev. Jim Booth, assigned as priest at Blessed Sacrament two years ago, increased the frequency of the Latin Mass there from once a month to every week. Booth, who grew up Lutheran, converted to Catholicism in 2000 and was ordained a priest in 2007. He embraced the opportunity to practice the Mass in Latin, the language the Roman Catholic Church had prayed in for centuries. “I started to learn it by myself,” Booth said. Then he went to a seminary in Illinois that offers a week-long intensive training on how to do the Latin Mass. Blessed Sacrament on July 7 hosted a workshop on the Latin Mass, led by a visiting priest, the Rev. Brian Austin. The appeal of the Latin Mass lies in its sense of otherworldliness that the Latin brings, its devotees say. “There’s a greater sense of reverence,” Booth said. Praying together in the ancient church language of Latin has a binding effect, said Sam Thompson, who grew up as an Episcopalian. The Tridentine Latin Mass, established by the Counil of Trent (1545-63), made Latin the official language of the Mass. Some hold that Vatican II restored elements of worship that had been displaced by the Council of Trent. The post-Vatican II English translation of the Latin Mass has recently been revised, with changes going into effect last year that more accurately reflect the Latin. Still, there are growing numbers who prefer the Latin itself. In addition to Blessed Sacrament, there is weekly Latin Mass on Sunday at 12:45 p.m. at St. Mary of the Visitation in Huntsville, and Sunday Latin Mass at Christ the King in Cullman at 7 a.m. and 10 a.m. Christ the King chapel was founded by a former Benedictine monk, the late Rev. Leonard Giardina, who was considered in schism for years because he broke away to start the community without permission. The Latin Mass there is now approved of by the Catholic Diocese of Birmingham. Rumore said that for years, people thought that anyone who preferred the Latin Mass was some kind of holdout against Vatican II. Blessed Sacrament is located at 1460 Pearson Avenue SW—in the West End of Birmingham, near Elmwood cemetery. The Traditional Latin Mass is offered there every Sunday at 11:30 a.m. UPDATE (01/01/2014): The Traditional Latin Mass is now offered there every Sunday at 10:45 a.m.